After four months of hard work and studying for about 10-15 hours per week, I finally took the CFA Level I Exam on June 2nd. I won’t actually find out whether I passed or not until July 24 (about 7 weeks after the test). Just to recap, here are some quick facts about the test: The Level I CFA Exam consists of two 3-hour sessions, the first from 9am-12pm and the second from 2pm-5pm. Each session is comprised of 120 multiple choice questions, for an overall total of 240 questions. The questions have three answer choices each, and the exam uses pencil-and-paper and a scantron answer form. Two specific models of financial calculator are allowed – I used the HP BAII Plus. The CFA Institute changes the minimum passing score each year, but it seems to be around 70%. Every question is weighted equally, so you need to aim for 168 correct answers to be confident of passing. This is different from the GMAT, which is an adaptive test in which questions can be weighted differently depending on their difficulty level. The exam was given in a huge conference room at the Anaheim convention center. I estimated there were about 1,000 test takers in the room, but that included all three CFA exam levels. Although the exam didn’t formally start until 9am, they required everyone to be sitting quietly in their chairs by 8:30. There was a lot of sitting around while the staff did various administrative things before and after the actual exam times. I can’t discuss the content of the exam, as the CFA Institute has very strict non-disclosure rules. I can say that, as I expected, the most accurate practice test is the full-length ‘mock exam’ that is provided by the CFA Institute. The mock exam is 240 retired actual CFA Level I questions. If you plan on taking the CFA exam, I’d recommend a thorough understanding of every single one of the 240 practice questions. I made a big pack of flash cards (over 100 in total) of formulas to memorize, and that turned out to be very helpful. Some of the questions simply required knowledge of a specific formula – if you knew the formula, you could plug in the numbers and get the question right; if you didn’t, you had to guess. Since the CFA exam is pencil-and-paper, you can skip questions and come back to them later. Within each 120-question section, there were probably 10-15 questions that I was unsure about; I passed them over with the intention of coming back to them at the end. However, when I got to the end of the section, I actually didn’t have much time for the questions I had skipped; I wound up just choosing my first instinct. The fact that you can skip questions is a difference between the CFA exam and the GMAT. Since the GMAT is computerized, you have to answer each question before you proceed to the next one, and you can’t go back and change your answers. On the CFA exam, you can change an answer choice if you have the time to carefully erase the previous one. There was a two-hour break from 12-2 during which we could get lunch. However, we had to be back in our seats by 1:30, and there were huge lines for all the fast food establishments on site. So the break felt a little rushed. I managed to get a tall Starbucks coffee and the 260 mg of caffeine helped me stay focused during the afternoon session. Still, I was fading out towards the end due to tiredness and mental fatigue. Overall, the exam is definitely tougher than the GMAT, mostly due to the sheer volume of material and the 6-hour length. Honestly, after taking the CFA exam, the 3-hour time of the GMAT seems like a cakewalk.  Regarding exam prep, I prepared using 1) The CFA books themselves 2) The short 60-question sample exams provided by CFA Institute 3) The full-length mock exam from the CFA Institute and 4) A single Schweser full-length exam that I purchased for $50. I didn’t take the Schweser full-length class, and I didn’t buy the Schweser notes. After talking to other people on exam day, it seemed like no one besides me had prepared from the actual CFA books. Almost everybody had taken a Schweser course and many people had the Schweser notes. I guess it remains to be seen what is more effective. 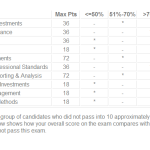 I wish the CFA Institute gave the exam results right away. However, the results won’t be available until July 24th. If you pass, you simply get a “pass” grade without knowing how much you passed by; if you don’t pass, they give you a general ranking of how close you came. I am looking forward to seeing how I did, and in the meantime will resume tutoring and writing about the GMAT. 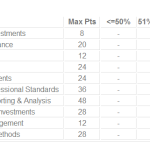 CFA Level I Exam Results: Passed! Thank you for this. I’ve been looking at CFA courses for a while now, but I’m odd in that I like to see peoples experience with something before I invest my time in it. You’ve really gave me an informative look at what it’s like to enrol in CFA. I also really liked that you added your prep for the exam. That will come in handy when it comes around to exam time for myself! Thank you for sharing. Thanks for the comment Emma. I hope my prep will come in useful if you decide to take Level I.